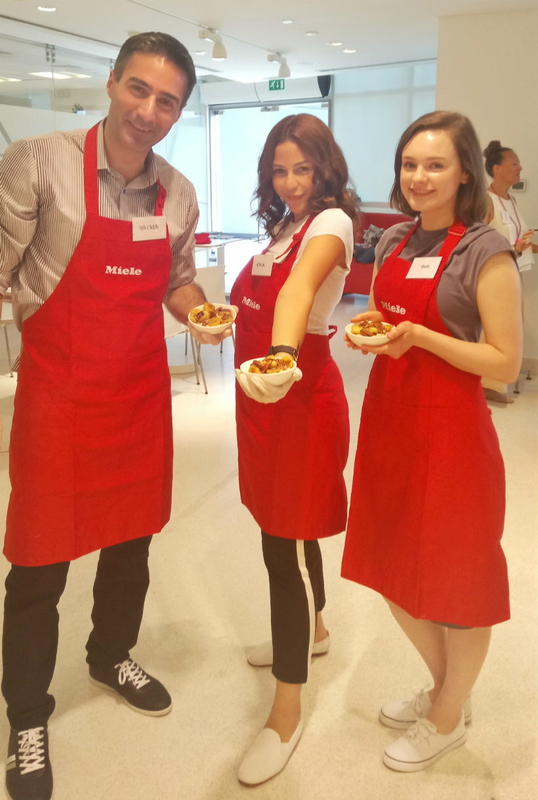 My first vegan cooking class… and my first-ever cooking class at all. I’ve loved cooking and baking since I was little but I’ve always done it in the kitchen at home (and the odd Food Tech lesson at school — I still use the chow mein recipe they taught us). I’m very introverted and cooking is something I do by myself to unwind, so going to a class with actual people was a step outside my comfort zone, but I’m really happy I went! Raw chocolate tart, so bloody good. Everything was delicious and full of flavour, but my favourite was definitely the raw chocolate tart. 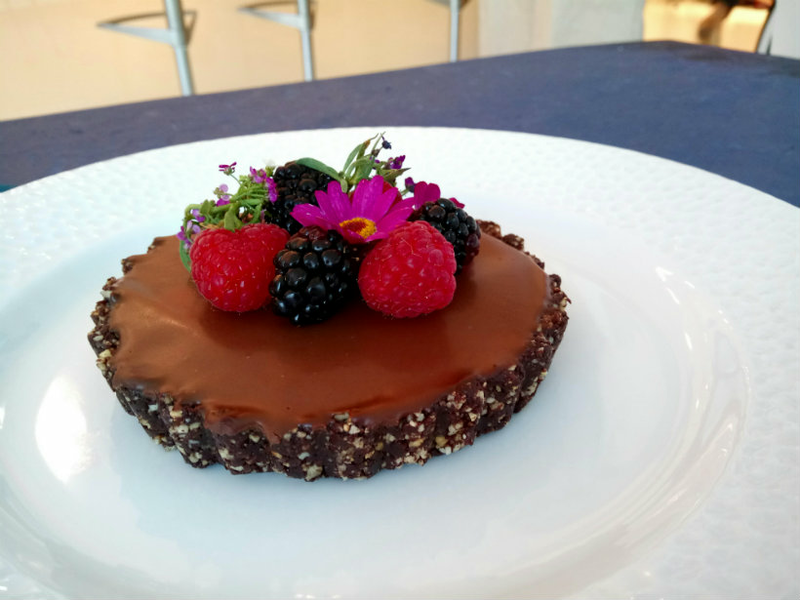 It had a roasted hazelnut base, creamy coconut and cacao filling, and a dark chocolate topping that contrasted perfectly with the fresh fruit I used for decoration. I’d love to make it next time we have a family gathering but my brother has a nut allergy — I’m going to experiment with making a nut-free version and see if it’s any good! We shared ingredients and cooking stations — this is our team looking very proud of our porridge. (I managed to drop oats all over the counter and we nearly burnt the bananas, but all was well in the end.) Rana and I are both vegetarians who often make and/or eat vegan food and would potentially go vegan one day, while Bachir had only ever boiled an egg before and wanted to try something new. 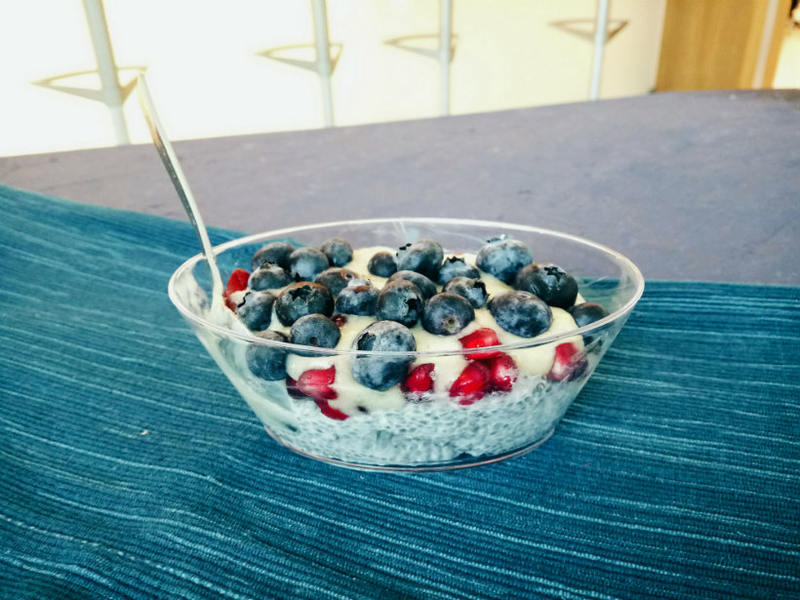 Something that was completely new to me was chia seed pudding, which I’ve seen on Instagram and in food magazines but never actually tried before. I’m still not sure if I like the consistency, but it’s supposed to be very good for you so I’m tempted to experiment with it when I get the time. I’ll be honest — I was mostly excited about the prospect of being able to eat so much fresh fruit. It turns out that mangoes, blueberries and pomegranate seeds make a dreamy combination. Confession: I had never actually eaten warm porridge before the class. Overnight oats, yes, plenty of times, because I can rarely be bothered to made breakfast in the morning, but never warm. My dad always has it in winter and when I had little I used to run away from the kitchen if he was eating it because I hated the way it looked. How times have changed! 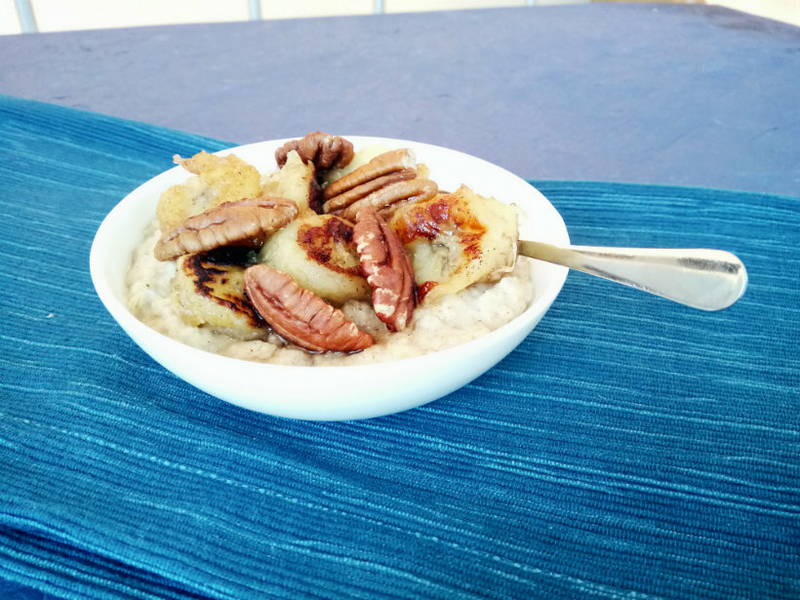 The spice porridge was super-easy and although caramelized bananas sound fancy, they were surprisingly simple to make, too. You throw some thick slices of banana into a pan and sprinkle some cinnamon over the top, then once they start to brown you add your syrup of choice (we used agave but I’m quite partial to maple syrup). This was the first dish I ate when we finished cooking everything and it made a lovely lunch — you can eat breakfast at any time of day, right? I had a wonderful time and I’d really recommend going to a cooking class, whether food is your thing or you want to learn your way around the kitchen. A huge thank you to Megha and Zendy for sharing their recipes with us! 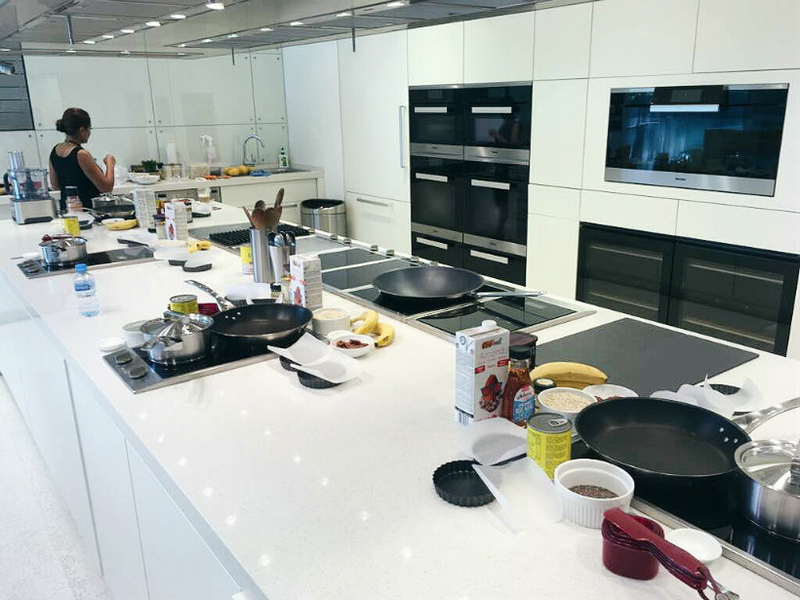 Have you ever been to a cooking class? What kind of food would you want to make? Let me know in the comments!